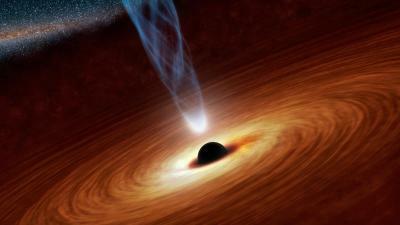 Astronomers have found a new way of measuring the spin in supermassive black holes. By viewing optical, ultra-violet and soft x-rays generated by heat as the black hole fed, they were able to measure how far the disc was from the black hole. Black holes lie at the centers of almost all galaxies, and can spit out incredibly hot particles at high energies that prevent intergalactic gases from cooling and forming new stars in the outer galaxy. Scientists don't yet understand why the jets are ejected into space, but some believe that their power could be linked to the spin of the black hole. Scientists at Durham University, UK, observed a black hole, NLS1 PG1244+026, with mass 10 million times that of our Sun, at the center of a spiral galaxy 500 million light years from Earth while it was feeding on the surrounding disc of material that fuels its growth and powers its activity. This distance depends on black hole spin as a fast spinning black hole pulls the disc in closer to itself, the researchers said. Using the distance between the black hole and the disc, the scientists were able to estimate the spin of the black hole. Spin is difficult to measure as it only affects the behavior of material really close to the black hole. Lead researcher Professor Chris Done, in the Department of Physics, at Durham University, said, "We know the black hole in the center of each galaxy is linked to the galaxy as a whole, which is strange because black holes are tiny in relation to the size of a galaxy. This would be like something the size of a large boulder (10m), influencing something the size of the Earth. "Understanding this connection between stars in a galaxy and the growth of a black hole, and vice-versa, is key to understanding how galaxies form throughout cosmic time. "If a black hole is spinning it drags space and time with it and that drags the accretion disc, containing the black hole's food, closer towards it. This makes the black hole spin faster, a bit like an ice skater doing a pirouette. "By being able to measure the distance between the black hole and the accretion disc, we believe we can more effectively measure the spin of black holes. "Because of this, we hope to be able to understand more about the link between black holes and their galaxies." The Durham scientists were able to measure the spin of the black hole using soft x-ray, optical and ultra-violet images captured by the European Space Agency's XMM-Newton satellite. Data on PG1244+026 did not have sufficient statistics at high energy to give a good measure of black hole spin from the iron line profile but cosmological simulations predict that black holes with similar masses have similar growth histories and so should have similar spins. The authors said further research was needed to reduce the effects of black hole mass on their findings.